Book of Immortals is a 5-reel 3-row 10-payline Ancient-Egypt themed game produced by iSoftBet taking you to the dawn of one of the most glorious civilizations of the world. Those were the days when gods walked among humans and pharaohs and you can revive the experience. Featuring Scarab Swap, Expanding Free Spins and the unique Ancient Reel and Immortal Reels bonuses, the game pays a maximum of 200x your stake. Find more in the Book of Immortals slot review. Tired of reading? See the Book of Immortals screenshots below and then claim one of the bonus offers of our recommended casinos to play for free or real! Even though the scenery is set millenniums ago, this is a modern game you can play for fun or for real money, depending on your gaming experience. Newbies always ask is there the Book of Immortals Free Play mode and if the answer is “yes”, this is a clear sign they will be able to learn how to win and pay nothing in front for this service. In any case, the coin value ranges from €0.01 to €10 allowing a strategy with wagers between €0.10 and €10 per round. It’s not any surprise to see the paytable crowded with themed icons representing various Egyptian deities, designed as powerful warriors making your knees shaking once they land on the reels. Try to drive fear away by collecting 3 or more symbols of the same kind and you’ll receive a decent prize or start the Book of Immortals Bonus in case those symbols were Scatters. The first-case scenario pays between 5 and 150 coins for combinations of 2 to 5 matching icons. On the other side of the pyramid, prospective winners will see lower-paying icons represented by the standard excerpt from a deck of 52 cards. This is where you should satisfy with a maximum of 50 coins. Thanks to the Scarab Swap feature, the game can quickly change the tide by replacing random symbols with the ones more willing to bring a decent payout. The game’s main logo works as the Scatter Wild and replaces all other paying icons. During the bonus round, a single book is worth 3 extra spins. When 3+ Scatters land anywhere on the reels, you will activate the Book of Immortals Free Spins game. When the round starts, the Ancient Reel will choose a special symbol to expand throughout the extra spins. Moreover, any god symbol selected during this round will become immortal and expand on every new spin – courtesy of the Immortal Reels feature. Depending on the number of Scatters, you will get 10 rounds at the casino’s expense with all winnings multiplied 2x, 20x, or 200x the line bet. Play online around the sites powered by iSoftBet directly on your mobile device. You won’t have to download an app for Android or iPhone. 3. What is the RTP factor of Book of Immortals? The Book of Immortals recension stays close to the official RTP info of 96.31%. This is a medium to low volatility game that will suit players of all experience levels, even though high rollers may want to look for a more lucrative solution. 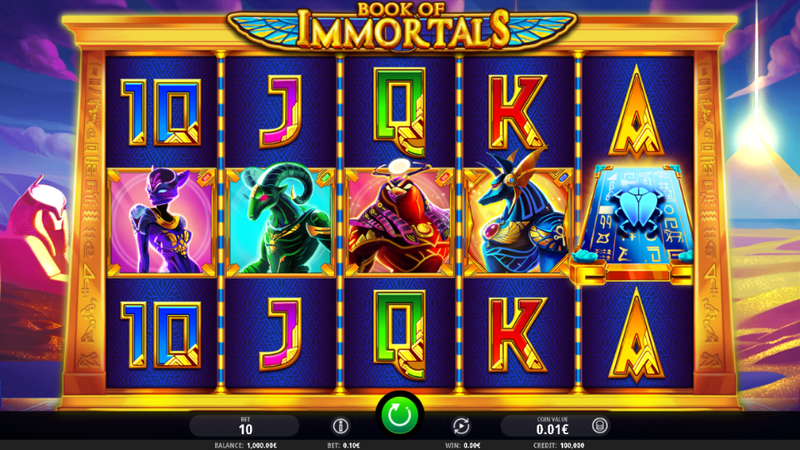 Go with the Book of Immortals tips and extend the gameplay in this visually-appealing and interesting slot machine.